Romain Amalfitano is the latest Newcastle United fringe player to leave the club, but fellow midfielder Gael Bigirimana is adamant he will not be joining him. In joining Dijon on a season-long loan, Amalfitano became the eighth player to leave since last season, with only on-loan striker Loic Remy coming in their place. But 19-year-old Bigirimana is determined to stay and fight for his place, rather than leaving on a temporary basis to get more football. The announcement of the Premier League squad lists this week showed the fragility of Newcastle’s squad after a summer which saw only Queens Park Rangers forward Remy join the club. Newcastle could only name 24 of the permitted 25 senior players, and had only nine “home-grown” players. Clubs are allowed a maximum of 17 who do not meet the criteria. That list does not include under-21 players like Bigirimana, Sammy Ameobi and Haris Vuckic, however. James Perch – who was sometimes preferred to Bigirimana as a holding midfielder last season – Steve Harper and Danny Simpson were all released. 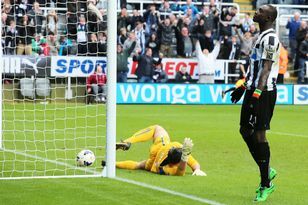 Amalfitano is the latest to leave – albeit temporarily – in yet another purge of Newcastle’s fringe players. But it does not seem like Bigirimana will follow him. “People can say it’s best for me to go on loan, but I’m not going anywhere,” he said. “I’m going to stay here. I’m going to be patient, and I’m going to work my socks off. “I showed last year that I didn’t look out of place in the big games. That’s not being big-headed. That’s how I feel I did. So I’m not going on loan. My target this season is to fight. You never know how the season can change. Bigirimana made 24 appearances in his first season after joining from Coventry City, but has only started three games – all in the cups – in 2013. Amalfitano’s fall from grace was much quicker. His only Newcastle start came in a Europa League qualifying tie in Maritimo. He has returned to France in the same week his brother, Morgan, came the other way to join West Bromwich Albion on a season-long loan. The 24-year-old will not even be playing in Ligue 1, having joined second-tier Dijon. Amalfitano joined as a free agent last summer after running down his Rennes contract. Shane Ferguson, Conor Newton, James Tavernier, Mehdi Abeid and Michael Richardson have also been loaned out this season. Wednesday’s game will raise funds for Newcastle’s Foundation, and the Sir Bobby Robson Foundation. Newcastle will feature Keith Gillespie, David Ginola, Nolberto Solano, Faustino Asprilla, Peter Beardsley, Andy Cole, Les Ferdinand and Alan Shearer. Franco Baresi, Paolo Maldini, Alessandro Costacurta, Zvonimir Boban, Mark van Bommel and Christian Vieri are among the stellar names in the opposition squad.